1. Place a pan of water on the stove with salt and a splash of olive oil. 2. In a large heavy-based frying pan over a high heat add 4 good lugs of quality olive oil, add the shallots, chilli and garlic and stir for 1 minute without colouring the garlic. 3. Cook the pasta in the boiling salted water for 3 minutes. 4. 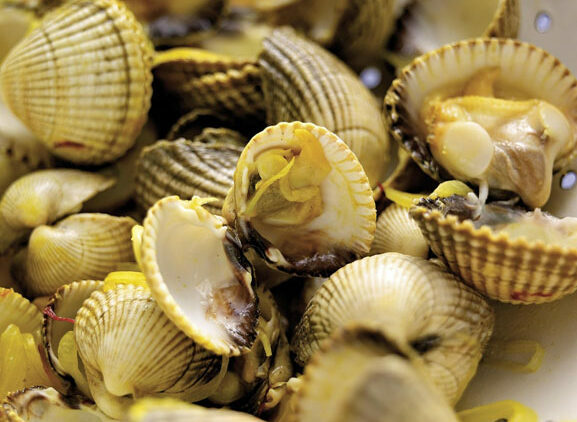 Add the clams to the frying pan and immediately pour in the white wine. Cover and cook for 2 minutes until they open fully, pull the pan to the side and pull the pasta pan close to it. Do not drain the pasta, use tongs instead to transfer the pasta to the pan, this allows some of the starchy water to come with it and helps to emulsify everything. 5. Stir well and add the parsley, season with a little salt, some milled black pepper and more olive oil. Serve immediately.